Rapid antidepressant effects of ketamine become most evident when its psychotomimetic effects subside, but the neurobiological basis of this “lag” remains unclear. Laughing gas (N2O), another NMDA-R (N-methyl-d-aspartate receptor) blocker, has been reported to bring antidepressant effects rapidly upon drug discontinuation. We took advantage of the exceptional pharmacokinetic properties of N2O to investigate EEG (electroencephalogram) alterations and molecular determinants of antidepressant actions during and immediately after NMDA-R blockade. Effects of the drugs on brain activity were investigated in C57BL/6 mice using quantitative EEG recordings. Western blot and qPCR were used for molecular analyses. Learned helplessness (LH) was used to assess antidepressant-like behavior. Immediate-early genes (e.g., bdnf) and phosphorylation of mitogen-activated protein kinase—markers of neuronal excitability—were upregulated during N2O exposure. Notably, phosphorylation of BDNF receptor TrkB and GSK3β (glycogen synthase kinase 3β) became regulated only gradually upon N2O discontinuation, during a brain state dominated by slow EEG activity. Subanesthetic ketamine and flurothyl-induced convulsions (reminiscent of electroconvulsive therapy) also evoked slow oscillations when their acute pharmacological effects subsided. 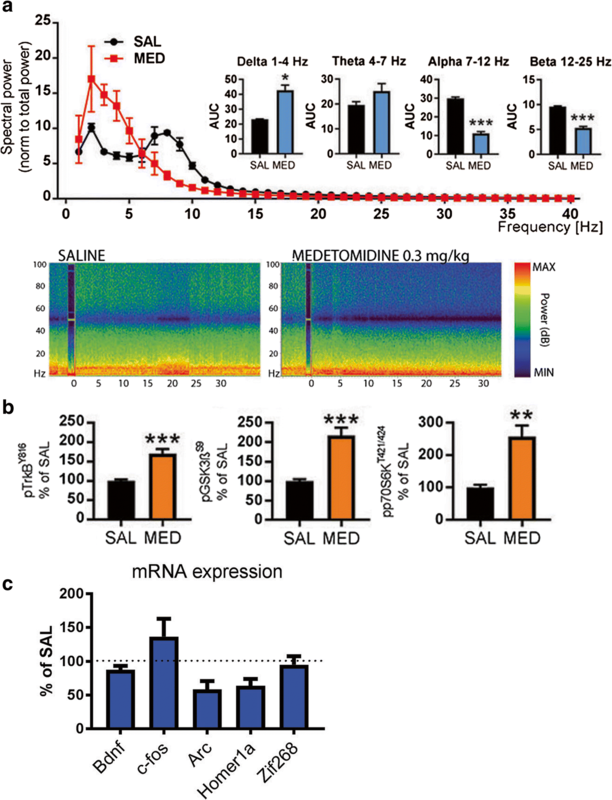 The correlation between ongoing slow EEG oscillations and TrkB-GSK3β signaling was further strengthened utilizing medetomidine, a hypnotic-sedative agent that facilitates slow oscillations directly through the activation of α2-adrenergic autoreceptors. Medetomidine did not, however, facilitate markers of neuronal excitability or produce antidepressant-like behavioral changes in LH. 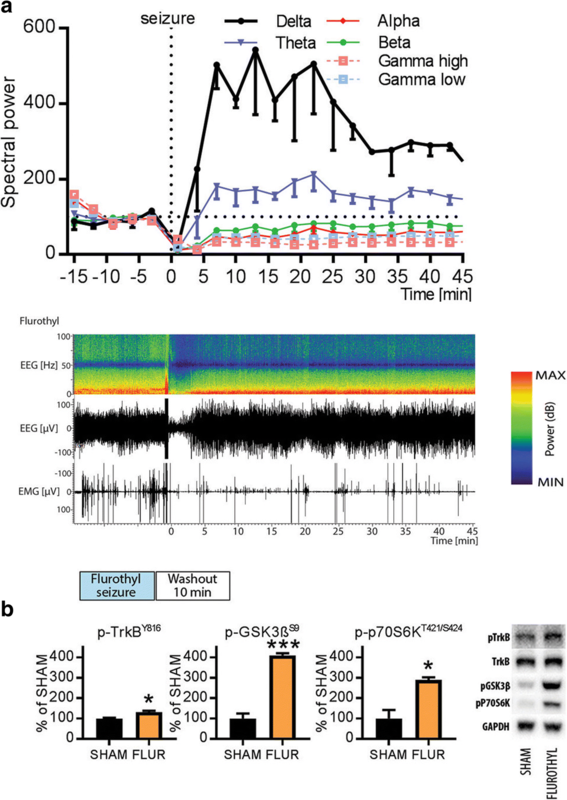 Our results support a hypothesis that transient cortical excitability and the subsequent regulation of TrkB and GSK3β signaling during homeostatic emergence of slow oscillations are critical components for rapid antidepressant responses. Samuel Kohtala and Wiebke Theilmann contributed equally to this work. The online version of this article ( https://doi.org/10.1007/s12035-018-1364-6) contains supplementary material, which is available to authorized users. Major depression is a highly disabling condition, the most significant risk factor for suicide and one of the biggest contributors to the global disease burden . Many patients respond poorly to standard antidepressants, and with those who do respond, the therapeutic effects become evident with a considerable delay. Furthermore, the clinical diagnosis of major depression and the treatments in current use are lacking objective biomarkers . The remarkable ability of NMDA-R (N-methyl-d-aspartate receptor) blocker ketamine, a dissociative anesthetic drug, to ameliorate depressive symptoms rapidly after a single subanesthetic intravenous infusion has stimulated great enthusiasm among scientists and clinicians [3, 4]. Reported response rates to ketamine are impressive, but many patients remain treatment-refractory . Therefore, extensive research efforts have been invested to find predictive efficacy markers and to uncover the precise pharmacological basis governing ketamine’s antidepressant effects. Experimental evidence suggests that ketamine increases glutamate release and enhances glutamatergic AMPA-R (α-amino-3-hydroxy-5-methyl-4-isoxazolepropionic acid receptor) function, which in turn augments synaptic plasticity through the BDNF (brain-derived neurotrophic factor) receptor TrkB [5, 6, 7, 8, 9, 10]. Indeed, positive allosteric AMPA-R modulators increase BDNF synthesis in the brain and produce antidepressant-like effects in rodents . Inhibition of GSK3β (glycogen synthase kinase 3β), another molecular event tightly connected with ketamine’s therapeutic effects , also contributes to the enhanced AMPA-R function . The antidepressant effects of subanesthetic ketamine become most evident when its psychotropic actions and acute pharmacological effects on NMDA-R fade [3, 14], but the neurobiological basis of this “lag” remains unclear. Indeed, after systemic administration, ketamine is readily distributed in the body and it undergoes rapid elimination and metabolism . Notably, a recent animal study suggests that some of the metabolites of ketamine, especially hydroxynorketamines that preferentially act through AMPA-R, may account for the antidepressant effects of ketamine  (However, see 17). This hypothesis, however, conflicts with earlier investigations emphasizing the critical role of NMDA-R blockade and the promising clinical observations with some other NMDA-R antagonists in depressed patients . Of these agents, nitrous oxide  (N2O, “laughing gas”) is particularly interesting since (in both mice and humans) it has extremely fast kinetics and is essentially not metabolized in the body. Notably, in this small pilot study conducted by Nagele and colleagues , the antidepressant effects of N2O were observed few hours after the gas administration, a time period when the drug has been essentially eliminated from the body. Moreover, rapid improvement of depression has been occasionally reported after electroconvulsive therapy (ECT), a non-pharmacological treatment where an electric pulse is delivered into the scalp to induce transient epileptiform activity in the EEG (electroencephalogram) . Analogous effects are produced by some pharmacological convulsants such as GABAA-R (γ-aminobutyric acid receptor type A) antagonist flurothyl [22, 23, 24], which are however no longer used in clinical practice. 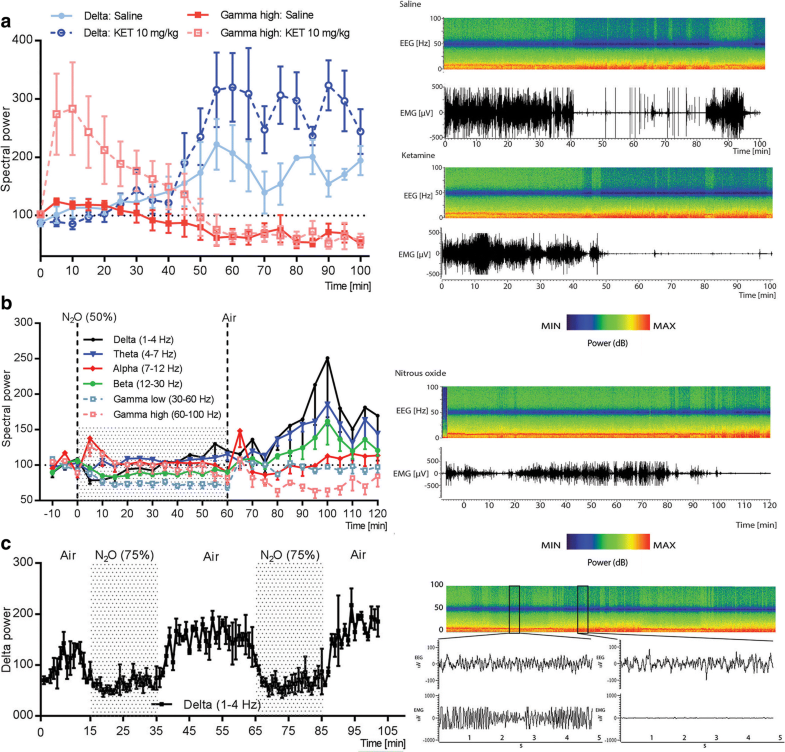 Postictal (i.e., after seizure) emergence of slow EEG activity within the delta (1–4 Hz) and theta range (4–7 Hz) and/or burst suppression pattern has been associated with the efficacy and onset-of-action of “convulsive therapies” . Interestingly, acute administration of subanesthetic doses of NMDA-R antagonists ketamine and MK-801 has also been associated with gradual increases in slow EEG activity [26, 27, 28]. These slow oscillations are thought to emerge as a homeostatic response of neuronal networks to the preceding cortical excitation, which in the case of ketamine is suggested to result from the preferential inhibition of NMDA-R located on inhibitory interneurons and the following disinhibition of pyramidal neurons [9, 29, 30]. Notably, slow oscillations are characteristic of deep NREM (non rapid-eye movement) sleep and can also be increased directly and without preceding cortical excitation with diverse hypnotic/sedative agents . One of these drugs is medetomidine, a selective α2-adrenergic autoreceptor agonist commonly used to produce sedation and anesthesia in veterinary medicine. To provide a better understanding of the rapid antidepressant mechanisms, we took advantage of the rapid pharmacokinetic and dynamic properties of N2O to investigate potential shared EEG alterations and the regulation of the molecular determinants of antidepressant actions during and after NMDA-R blockade. Our findings suggest that N2O, similarly to that with subanesthetic ketamine and fluorothyl, produces a transient period of cortical excitation during gas administration which is followed by rebound emergence of homeostatic slow EEG oscillations after the gas flow is suspended. Most interestingly, TrkB and GSK3β signaling alterations remain unchanged during N2O exposure but are evoked gradually upon gas discontinuation along with slow oscillations. The positive correlation between the emergence of slow EEG oscillations and TrkB and GSK3β signaling was further strengthened with medetomidine. Medetomidine did not, however, facilitate markers of neuronal excitability or produce antidepressant-like behavioral changes in LH. This study supports a hypothesis that transient cortical excitability and the subsequent regulation of TrkB and GSK3β signaling during rebound slow oscillations are critical components for rapid antidepressant responses. Adult C57BL/6JRccHsd mice (Harlan Laboratories, Venray, the Netherlands) were used. Animals were maintained in the animal facility of University of Helsinki, Finland, under standard conditions (21 °C, 12-h light-dark cycle) with free access to food and water. The experiments were carried out according to the guidelines of the Society for Neuroscience and were approved by the County Administrative Board of Southern Finland (License: ESAVI/10527/04.10.07/2014). Medical grade N2O (Livopan 50% N2O/O2 mix, Linde Healthcare; Niontix 100% N2O, Linde Healthcare) and medical grade oxygen (Conoxia 100% O2, Linde Healthcare) were mixed with 100% N2O to achieve > 50% N2O concentrations. After habituation to the experimental conditions, the gas was administered into airtight Plexiglass chambers (for biochemical analyses (width × length × height): 14 cm × 25 cm × 9 cm; for biochemical and EEG analyses: 11.5 cm × 11.5 cm × 6.5 cm) with a flow rate of 4–8 l/min. O2 or room air was used as control gas. To induce myoclonic seizures, 10% flurothyl liquid (in 90% ethanol; Sigma-Aldrich) was administered into the cotton pad placed inside the lid of an airtight Plexiglass chamber (13 cm × 13 cm × 13 cm) at the flow rate of 100–200 μl/min until the mice exhibited seizures. The lid was removed to terminate the seizure. Animals were euthanized at indicated times post-seizure. Ethanol solution was given for the sham animals. Ketamine-HCl (7.5–10 mg/kg; Ketaminol®, Intervet International B.V.) and medetomidine-HCl (0.05–0.3 mg/kg, i.p./s.c. ; Domitor®, Orion Pharma) were diluted in isotonic saline solution and injected intraperitoneally with an injection volume of 10 ml/kg. Animals were euthanized at indicated times after the treatments by rapid cervical dislocation followed by decapitation. No anesthesia was used due to its potential confounding effects on the analyses [32, 33]. Bilateral medial prefrontal cortex (including prelimbic and infralimbic cortices) was rapidly dissected on a cooled dish and stored at − 80 °C. For western blotting, the brain samples were homogenized in lysis buffer (137 mM NaCl, 20 mM Tris, 1% NP-40, 10% glycerol, 48 mM NaF, H2O, Complete inhibitor mix (Roche), PhosStop (Roche)) . After ~ 15 min incubation on ice, samples were centrifuged (16,000×g, 15 min, + 4 °C) and the resulting supernatant collected for further analysis. Sample protein concentrations were measured using Bio-Rad DC protein assay (Bio-Rad Laboratories, Hercules, CA). Proteins (40–50 μg) were separated with SDS-PAGE under reducing and denaturing conditions and blotted to a PVDF membrane as described. Membranes were incubated with the following primary antibodies (see (32)): anti-p-TrkB (#4168; 1:1000; Cell signaling technology (CST)), anti-TrkB (1:1000; #4603, CST), anti-Trk (sc-11; 1:1000; Santa Cruz Biotechnology (SCB);), anti-p-CREB (#9191S; 1:1000; CST), anti-p-p70S6K (#9204S; 1:1000; CST), anti-p-GSK3βS9 (#9336; 1:1000; CST), anti- p-p44/42-MAPKThr202/Y204 (#9106, 1:1000, CST), anti-GSK3β (#9315, 1:1000, CST), anti-p70S6K (#2708, 1:1000, CST) anti-p44/42-MAPK (#9102, 1:1000, CST), and anti-GAPDH (#2118, 1:10000, CST). Further, the membranes were washed with TBS/0.1% Tween (TBST) and incubated with horseradish peroxidase conjugated secondary antibodies (1:10000 in non-fat dry milk, 1 h at room temperature; Bio-Rad). After subsequent washes, secondary antibodies were visualized using enhanced chemiluminescence (ECL Plus, ThermoScientific, Vantaa, Finland) for detection by Biorad ChemiDoc MP camera (Bio-Rad Laboratories, Helsinki, Finland). For qPCR, total RNA of the sample was extracted using Trizol (Thermo Scientific) according to the manufacturer’s instructions and treated with DNAse I mix. mRNA was reverse transcribed using oligo (dT) primer and SuperScript III Reverse Transcriptase mix (Thermo Scientific). The amount of cDNA was quantified using real-time PCR. The primers used to amplify specific cDNA regions of the transcripts are shown in Table S1. DNA amplification reactions were run in triplicate in the presence of Maxima SYBRGreen qPCR mix (Thermo Scientific). Second derivate values from each sample were obtained using the LightCycler 480 software (Roche). Relative quantification of template was performed as described previously using standard curve method, with cDNA data being normalized to the control Gapdh and ß-actin level. For the implantation of electrodes, mice were anesthetized with isoflurane (3% induction, 1.5–2% maintenance). Lidocaine (10 mg/ml) was used as local anesthetic and buprenorphine (0.1 mg/kg, s.c.) for postoperative care. Two epidural screw EEG (electroencephalogram) electrodes were placed above the fronto-parietal cortex. A further screw served as mounting support. Two silver wire electrodes were implanted in the nuchal muscles to monitor the EMG (electromyogram). After the surgery, mice were single-housed in Plexiglas boxes. After a recovery period of 5–7 days, animals were connected to flexible counterbalanced cables for EEG/EMG recording and habituated to recording cables for 3 days. Baseline EEG (10–15 min) recordings of awake animals were conducted prior the treatments. All injection treatments were conducted in the animal’s home cages during light period. N2O treatment was delivered in homemade anesthesia boxes for indicated time periods with a flow rate of 8 l/min. The EEG and EMG signals were amplified (gain 5 or 10 K) and filtered (high pass: 0.3 Hz; low pass 100 Hz; notch filter) with a 16-channel AC amplifier (A-M System, model 3500), sampled at 254 Hz or 70 Hz with 1401 unit (CED), and recorded using Spike2 (version 8.07, Cambridge Electronic Devices). The processing of the EEG data was obtained using Spike2 (version 8.07, Cambridge Electronic Devices). EEG power spectra were calculated within the 1–50 Hz frequency range by fast Fourier transform (FFT = 256, Hanning window, 1.0 Hz resolution). Oscillation power in each bandwidth (delta = 1–4 Hz; theta = 4–7 Hz; alpha = 7–12 Hz; beta = 12–25 Hz; gamma low = 25–40 Hz; gamma high = 60–100 Hz) was computed in 30–300-s epochs from spectrograms (FFT size: 1024 points) for each animal. Representative sonograms were computed using a Hanning window with a block size of 512. Animals were placed in a shuttle box (Panlab LE100-26, LE900; Software: Bioseb Packwin) and let habituate for 3 min. On day 1, a pre-test was conducted consisting of 140 randomly paced (at 25, 30, or 35 s intervals) inescapable foot shocks (0.45 mA, 20 s duration). The pre-test was repeated on day 2. On day 3, testing was conducted starting with 1-min habituation and followed by 15 randomly paced (at 25, 30, or 35 s intervals) escapable shocks (0.45 mA, 20 s duration). During testing, animals were able to interrupt the shock delivery/escape by crossing to another chamber. If the animal failed to escape during the first 10 s of a test shock, the trial was considered as a failure. If more than 50% of the 15 trials led to a failure, the animal was considered helpless. After testing, animals were injected (i.p.) with saline, ketamine (15 mg/kg), or medetomidine (0.05 mg/kg). Learned helplessness was re-evaluated 24 h post-injection. Depending on whether data were normally distributed or not, either parametric or nonparametric test was used for statistical evaluation. In case of more than two groups, analysis of variance (ANOVA) with post hoc test was used. All statistical analyses were performed with the Prism 7 software from GraphPad (La Jolla, CA, USA). All tests were two-sided; a P ≤ 0.05 was considered significant. Details of statistical tests and n numbers for each experiment are shown in Table S2. Clinically effective rapid-acting antidepressants have the capacity to rapidly yet transiently increase cortical excitability. To test whether N2O produces similar effects, we adopted the treatment protocol used in the clinical study by Nagele et al. and investigated how biological markers associated with neuronal excitability are regulated. Mice received continuous 50% of N2O for an hour after which the animals breathed room air for another hour. We focused our analyses to the medial prefrontal cortex (mPFC), a brain region associated in the pathophysiology of depression and antidepressant actions. 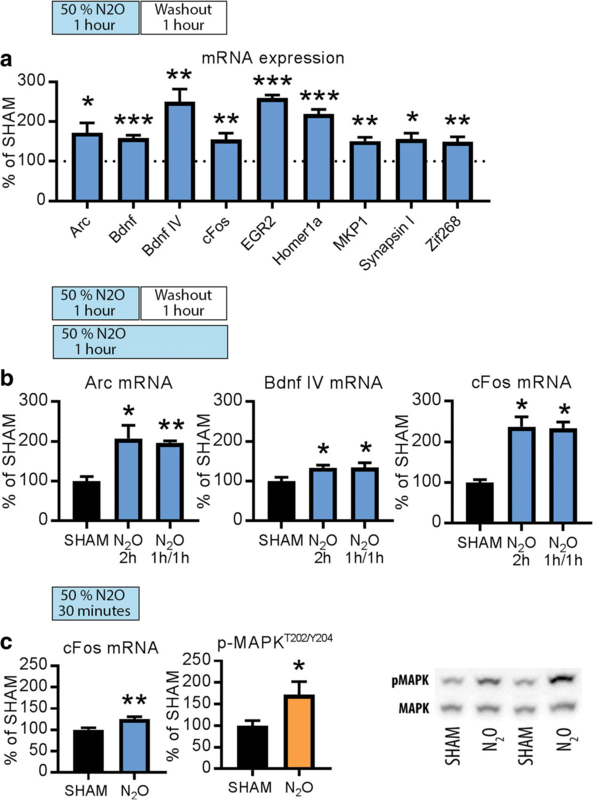 This N2O treatment increased the expression of several mRNAs of activity-dependent immediate-early genes (c-fos, arc, bdnf, zif-268, homer-1A, egr-2, mkp-1, synapsin) (Fig. 1a). To investigate whether these responses appear during N2O exposure or withdrawal, we carried out an experiment in which a subgroup of animals breathed contiously 50% N2O for 2 h and samples collected immediately thereafter. Importantly, arc, bdnf, and c-fos mRNA levels were readily upregulated also by this treatment (Fig. 1b). Moreover, c-fos mRNA levels and phosphorylated mitogen-activated protein kinase (MAPKT202/Y204), another marker of increased neuronal excitability, increased already 30 min after the onset of N2O administration (Fig. 1c). Altogether, these data indicate the facilitation of cortical activity under N2O. Notably, these acute changes induced by N2O resemble those produced by electroconvulsive therapy (ECT) [34, 35], and sleep deprivation , which also rapidly alleviate depression in a subset of patients. Acute administration of low doses of NMDA-R antagonists has been associated with gradual increase in slow EEG activity after the acute effects on cortical excitability subside. Similarly to what has been reported earlier , a subanesthetic dose of ketamine initially increased gamma oscillations (Fig. 2a; see also Fig. S1), a neurophysiological sign of ongoing cortical excitability, which lasted around 30–50 min. After this time period, i.e., after the peak of ketamine’s pharmacological effects (serum t1/2 (mouse): ~ 15 min, see , slow-wave delta oscillations gradually increased above baseline compared to saline treated controls. 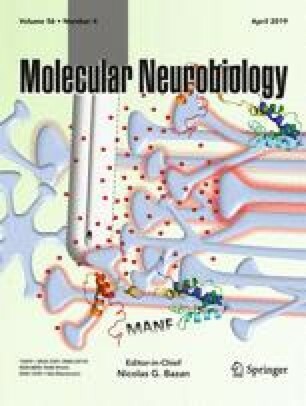 The ability of N2O to regulate various biological markers associated with neuronal excitability encouraged us to test whether similar phenomenon might occur following the treatment to N2O. Apart from the dampening of low gamma oscillations, no clear EEG alterations were observed during exposure of 50% N2O (Fig. 2b). Upon gas withdrawal, however, slow EEG oscillations increased above baseline values. The peak of slow-wave delta emerged at around 40 min post-N2O and reduced thereafter towards baseline. The duration of exposure and concentration of inspired N2O can be easily controlled by mixing it with oxygen to varying degrees. We therefore tested if short exposures to higher N2O concentrations evoke more substantial increase in slow EEG oscillations following drug discontinuation. Indeed, slow EEG oscillations, especially within the delta range, increased rapidly after a 20-min exposure to 75% N2O in both male and female mice and such effect could be rapidly reproduced with intermittent dosing (Fig. 2c; Fig. S1). Beta and low gamma oscillations were reduced during such N2O treatments, but these alterations normalized upon gas withdrawal (Fig. S2). Activation of BDNF receptor TrkB has been causally connected with antidepressant effects in rodents [39, 40]. Upon activation, TrkB receptors undergo phosphorylation within specific tyrosine residues within the intracellular domain [8, 39, 41, 42, 43]. These effects set forth regulation of several intracellular cascades  of which activation of MAPK  (see Fig. 1) and mTor (mammalian target of rapamycin) , and inhibition of GSK3β  has been strongly implicated in ketamine’s antidepressant effects. We thus next sought to investigate how TrkB, mTor, and GSK3β phosphorylation are regulated during N2O exposure and withdrawal. We first exposed animals to N2O for a period of 30-min and collected brain samples immediately thereafter. Interestingly, phosphorylation of TrkBY816, phosphorylation of GSK3β at the inhibitory serine-9 residue (GSK3βS9), and phosphorylation of p70S6kT421/S424 (downstream target of mTor) remained unaltered in these samples indicating that ongoing NMDA-R blockade is not directly associated with TrkB and GSK3β signaling alterations (Fig. 3a), although MAPK phosphorylation is concomitantly increased. To test the possibility that TrkB and GSK3β signaling alterations become evident upon withdrawal of N2O exposure (i.e., after NMDA-R blockade), we collected brain samples for western blot analyses 5 and 15 min after exposing the animals to varying N2O concentrations (50–75%) for 20 min. These data, shown in Fig. 3b, c, indicate that N2O can indeed induce TrkBY816 and GSK3βS9 phosphorylation but only upon gas withdrawal when slow EEG oscillations become also facilitated. Postictal emergence of slow EEG oscillation is also observed in patients after the delivery of flurothyl or ECT , and this phenomenon has been considered to predict the efficacy and onset-of-action of convulsive therapies . We sought to recapitulate this in rodents and to further test whether TrkB and GSK3β signaling is altered during a brain state dominated by slow EEG activity. Flurothyl was evaporated into the cage until the mice exhibited a generalized seizure, which terminated within seconds upon drug withdrawal. A robust increase in slow EEG oscillations, particularly within the delta range (1–4 Hz), emerged gradually and peaked within 10 min after the flurothyl-induced seizure (Fig. 4a). Notably, alpha oscillations (7–12 Hz), beta oscillations (12–30 Hz), and high-frequency gamma oscillations (> 25 Hz) were reduced during the postictal period. At the behavioral level, the mice appeared motionless and sedated; a state also correlated with reduced electromyogram (EMG) activity (Fig. 4a). Most importantly, phosphorylation levels of TrkBY816, p70S6kT421/S424, and GSK3βS9 were robustly elevated in samples collected 10 min after flurothyl (Fig. 4b). Collectively, our data so far suggests that rapid-acting antidepressants evoke TrkB and GSK3β signaling alterations during slow EEG oscillations that are generated as a withdrawal rebound response to the transient increase of cortical excitability induced by the drugs. To test whether these molecular alterations are dependent on preceding cortical excitability, we subjected mice to an acute treatment with medetomidine, a hypnotic-sedative agent that directly facilitates slow EEG activity (Fig. 5a). However, TrkBY816, p70S6kT421/S424, and GSK3βS9 phosphorylation levels were significantly increased also by this treatment (Fig. 5b) while it concomitantly brings unnoticeable acute effects on IEG expression and reduces gamma oscillations (Fig. 5c). This finding suggests that ongoing slow EEG activity, regardless of how it is regulated, positively correlates with molecular changes intimately connected with rapid antidepressant responses. A single subanethetic dose of ketamine has been shown to produce rapid and long-lasting antidepressant-like behavioral changes [5, 39]. In addition to TrkB-mTor and GSK3β pathways, activation of MAPK signaling has been strongly implicated in the behavioral effects produced by antidepressants [44, 45]. While medetomidine readily regulates TrkB and GSK3β signaling, MAPK phosphorylation is strongly reduced by this treatment (Fig. 6a). It is thus tempting to speculate that the mechanisms of rapid antidepressant treatments are related to the combination of both excitation induced changes in gene expression and the subsequent homeostatic activation of key neurotrophic signaling pathways during postictal-like slow EEG oscillations. We tested this hypothesis with medetomidine in the learned helplessness paradigm, which has strong construct validity regarding depression. In this model, a rodent is exposed to inescapable mild foot shocks and subsequently tested for a deficit (helplessness) of acquired avoidance. A single subanesthetic dose of ketamine ameliorated the avoidance deficit within 24-h while medetomidine showed no such effect (Fig. 6b). Despite great recent progress, the precise neurobiological basis governing rapid antidepressant effects remain obscure and debated [6, 17, 18, 46]. To get further insights into rapid antidepressant mechanisms, we investigated how N2O, another NMDA-R blocking dissociative anesthetic and a putative rapid-acting antidepressant , regulates EEG and the molecular level alterations previously implicated in rapid antidepressant mechanisms. The rapid pharmacokinetic properties of N2O allowed us to specifically and relatively precisely investigate these changes during the period of peak pharmacological effect and subsequently following NMDA-R blockade. Indeed, the antidepressant effects of subanesthetic ketamine become most evident few hours after infusion , at the time-point when the psychotomimetic effects of the drug have subsided. Similarly to other clinically effective rapid-acting antidepressants, N2O increased biological markers related to increased cortical excitability. These changes, the upregulation of IEGs and the activating phosphorylation of p44/42-MAPKT202/Y204, appeared very rapidly and already during gas administration. 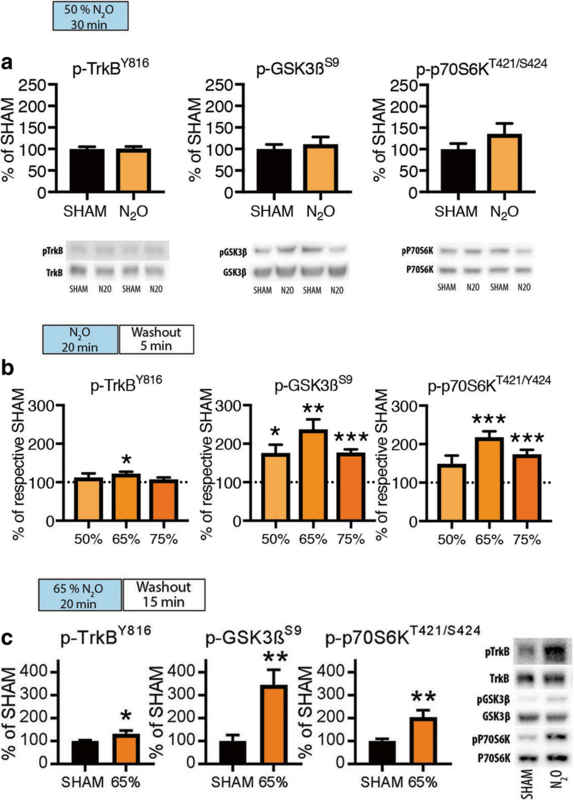 In contrast, phosphorylation of TrkBY816 and GSK3βS9 remained unaltered during N2O exposure and became regulated only gradually following drug discontinuation, during a brain state dominated by slow EEG activity and behavioral immobility. Importantly, and as previously shown, subanesthetic ketamine and flurothyl similarly evoked slow EEG oscillations that were generated after the peak of pharmacological effects had already passed. Moreover, TrkB and GSK3β signaling were robustly regulated during postictal slow EEG oscillations, a phenomenon previously associated with the efficacy and onset-of-action of ECT. While direct facilitation of slow EEG activity with medetomidine also produced robust phosphorylation of TrkB and GSK3β, no changes were present in the expression of IEGs and the phosphorylation of p44/42-MAPK was significantly decreased. 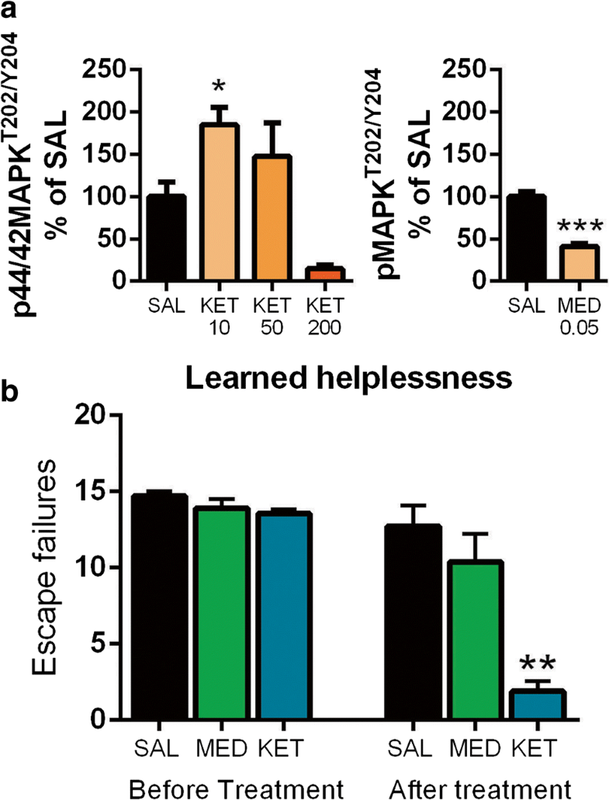 Unlike ketamine, medetomidine failed to produce antidepressant-like behavioral responses in the learned helplessness paradigm. Taken together, these findings support a hypothesis that consecutive facilitation of cortical excitability and the regulation of TrkB and GSK3β signaling during the rebound slow EEG oscillations are essential for rapid antidepressant responses. Comparing the effects of rapid-acting antidepressants and medetomidine provides an excellent strategy to reveal the different neurobiological effects and phenomena set forth by direct vs. homeostatic facilitation of slow EEG oscillations and TrkB signaling. This report proposes a novel link between a specific brain state, characterized by slow EEG oscillations and sedation, and the orchestrated and sequential regulation of multiple molecular targets implicated in rapid antidepressant responses. Furthermore, we demonstrate that this state and the accompanying regulation of molecular targets can be indirectly achieved by different excitatory interventions and speculate that this indirect homeostatically regulated state may be particularly important for rapid antidepressant effects. In a more general sense, this work urges shifting the attention towards understanding rapid antidepressant actions through alterations triggered within the brain as an adaptive consequence of a drug challenge. That said, interconnecting the present observations with the recently proposed effects of ketamine and other NMDA-R blockers on intrinsic homeostatic plasticity processes [9, 29, 30, 47, 48, 49, 50], also evident as dynamic and circadian fluctuations in slow EEG oscillations [51, 52, 53], is instrumental in providing a more precise understanding of rapid antidepressant actions. Altogether, translating the emerging mechanistic evidence and hypotheses between cortical excitation and slow waves [54, 55, 56, 57], such as the synaptic homeostasis hypothesis (SHY) of sleep [58, 59], to rapid antidepressant effects is essential in the future. The unique pharmacokinetic and pharmacological properties of N2O and related “fast-acting” medicines may become critical tools for these future efforts guiding the development of novel interventions against major depression. We thank Dr. Eero Castrén, Dr. Kai Kaila, Dr. Tarja Porkka-Heiskanen, Dr. Iiris Hovatta, and Dr. Raimo Tuominen for their comments on this work. Dr. Giuseppe Cortese is thanked for language editing. Tommi Makkonen, Sissi Pastell, Virpi Perko, Maria Partanen, Kari Tamminen, and Sari Pöysti are thanked for technical assistance. S.K., W.T., M.R., L.P., G.K., S.U., N.M., and T.R. performed experiments; S.K. and T.R. conceived the original hypotheses; S.K., W.T., H-K.W., and T.R. planned the experiments; S.K. and W.T. prepared the figures and statistics; S.K., K.J., A.Y-H., I.Y., and T.R. wrote the paper; T.R. provided funding; all authors approved the final manuscript. This study has been supported by the Academy of Finland (T.R., grants 276333, 284569, 305195, 312664), the Finnish Funding Agency for Innovation (T.R. ), and the Brain & Mind Doctoral School (S.K.). The experiments were carried out according to the guidelines of the Society for Neuroscience and were approved by the County Administrative Board of Southern Finland (License: ESAVI/10527/04.10.07/2014). University of Helsinki has filed a patent application wherein the data presented in this manuscript have been disclosed (S.K., W.T., and T.R. as inventors). K.J. has received speech honorarium from Otsuka Pharmaceutical, Lundbeck, and Medtronic. Sarlin Oy Ab and Oy AGA Ab provided equipment for gas administrations. M.R., L.P., G.K., S.U., A.Y-H., I.Y., N.M., and H-K.W. disclose no competing interests.